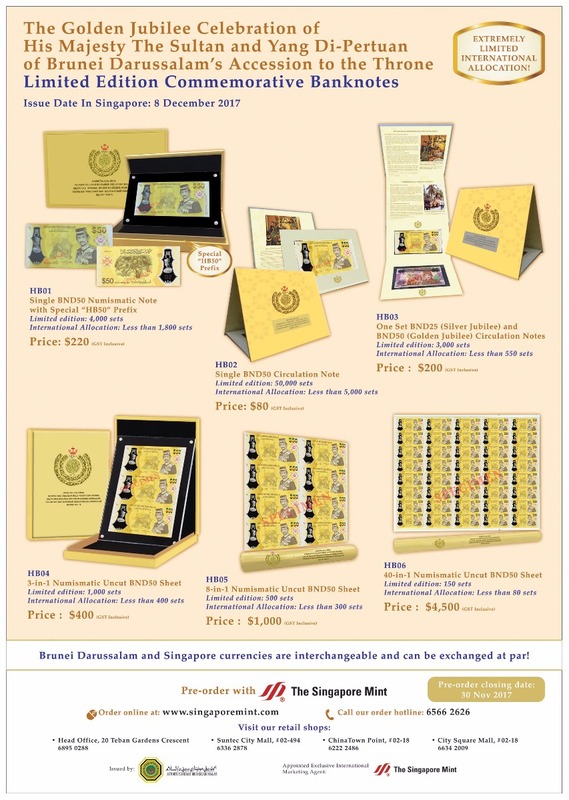 To mark the Golden Jubilee Accession to the Throne of His Majesty the Sultan and Yang Di-Pertuan of Brunei Darussalam, the Autoriti Monetari Brunei Darussalam (AMBD) has issued a commemorative Brunei dollar (BND) 50 polymer note and a range of Golden Jubilee banknote sets. Brunei Darussalam and Singapore currencies are interchangeable and can be exchanged at par. Coupled with the extremely limited international allocation, these commemorative banknotes are expected to be highly sought-after. Pre-order commences 8 November 2017 and closes on 30 November 2017. The issue date is from 8 December 2017 onwards. Please note that we do not fulfill international orders to Brunei Darussalam.